How often have I praised Mario Batali? I can’t count the times. I was about to prepare his recipe for Swordfish with Leeks and Grapefruit, but there was no Grapefruit. I did have lovely Swordfish from Adam’s Fairacre Farm, a dozen young Leeks, purchased at the Saugerties Farmers Market (from a farmer named Jacob of Deep Roots Farm), and Peaches. The result was different from Batali’s, but according to my dependable taster, Cathie, it was as good as the Grapefruit version. 1 TB of Lemon Juice. 1. Prepare the sauce, by combining the Orange Juice, Dijon Mustard, Mustard Seed & the 1/3 cup EVOO. Whisk together to emulsify. 2. Heat in a small sauce pan. Simmer until it’s reduced to the consistency of heavy cream. Set aside. 2. Season the Swordfish with Salt, Pepper & 1 TB of EVOO. 3. Add Salt & Pepper to the Leeks. 4. Heat another sauce pan with 3″ of water. When it comes to a boil, add 1 TB of Salt & the Leeks. Reduce to a simmer & cook for about 8 to 10 minutes. Remove & plunge into a bowl of ice water. Drain well & set aside. 5. Heat a grill pan to high. 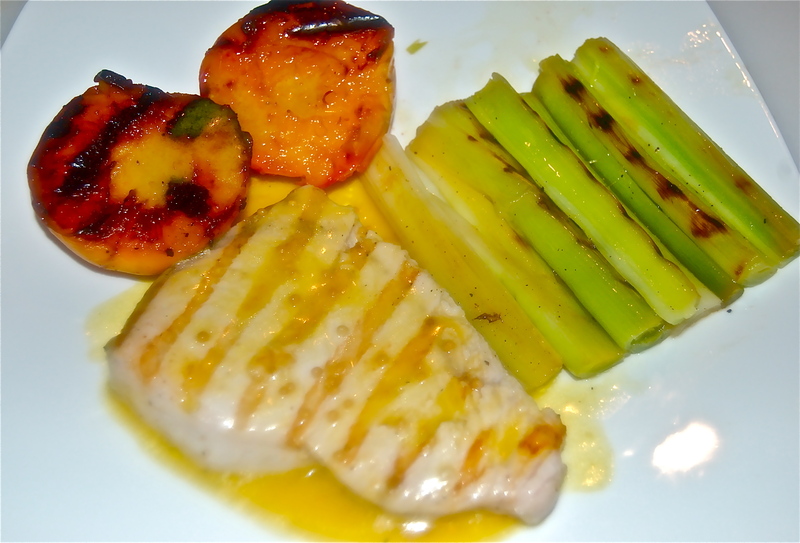 Add the 2 slices of Swordfish & grill for no more than 1 minute a side. If you have one, weigh the fish down with a cast iron grill press. Remove & keep warm with a foil cover. 6. In the same grill pan wiped clean, add a splash of EVOO & the Peaches, cut side down. Grill for about 5 to 7 minutes. Remove and keep warm with a foil cover. 7. Toss the drained Leeks in the Swordfish/Peaches pan for a few minutes to warm up. 8. Add all the components to serving plates.